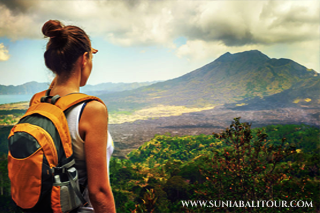 Bali Trekking and Spa Tour is an Bali Double Activities Tour Packages we created to make double impressive experience by allowed you to enjoy mount batur sunrise trekking tour and then continue to pamper your self with our spa treatmants packages. Our Bali Driver will pick up you at hotel in early morning to start the adventure of sunrise trekkig tour at mount Batur volcano. If you still sleepy, you can continue to sleep in our comportable car, the journey to tget to start point around two hours. After arrive at start point you will warm wellcome by our professional trekking guide, he will give you flash light for the trekking and the journey start for 2 hours to get to the top of the mountain. And on the top you will amazed with the amazing scenery of the sunrise and the biew of volcano, the trekking guide will prepared the brekfast for you. After finish the trekkingwe will directly to the Spa provider for enjoy the 2 hours spa treatmants. We know you will be tired after the trekking tour and this spa treatmants is the perfect choices to removed all your tired and you will feel refesh again. After the spa we will having lunch with Indonesian food at local restaurant. After lucnh we will drop you back to your hotel. This Bali Trekking and Spa Tour will give impressive experience while you spend your holiday in Bali and more enjoyable with our friendly Bali Tour Driver and comportable private Car. Bali Mount Batur Sunrise Trekking Tour is best hiking adventure to see the sunrise from the top of the mountain. Mount Batur is located in Batur village, Kintamani District, Bali, Indonesia. Mount Batur (Gunung Batur) is 1717 m above sea level can be summited by physically fit hikers in around 2 hours. Mount Batur Bali is an active volcano that draws tourists in with both beauty and promise of spectacular trekking tours. We offers climb Mount Batur Bali to enjoy an unforgettable sunrise from the top of an active volcano. Bali Spa Tour Packages we offer is the best spa treatmants to make your day like new again, The treatmants with professional theraphist which already known the best spot and strong pressure to make your body and mind refresh. The 2 hours spa tour pacakges we offer consist of 1 hours balinese massage and 1 hours spa treatmants. The Balinese believe that the body, mind and spirit work in harmony. The health and well being of all make the whole happy.